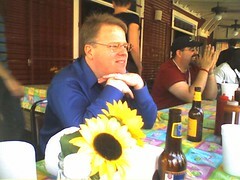 I think Robert Scoble looks like Phillip Seymour Hoffman. Welcome to the online home of Ruby Sinreich - mother, Buddhist, feminist, anti-racist, network organizer, localist, music lover, Durhamite, open source geek, Drupalist, and web developer who has worked in progressive advocacy organizations and online communities for over two decades. My blog and social media posts represent myself only and not any organizations or employers I may be associated with. It's not my job to speak for them. "I'd Rather Be Shaggin"... who wouldn't? Marvel on social justice in comics in 1969: "We can say we tried." Subscribe to receive e-mail notifications of new blog posts. All content on this site is sharable under a Creative Commons Attribution-NoDerivatives 4.0 International License.